Organic Sweet Wheatgrass seeds perfected for indoor growing. Grows four flats of Sweet Wheatgrass. Wheatgrass helps your body build red blood cells, which carry oxygen to every cell. By increasing the oxygenation in your body, you can help offset carbon monoxide and increase your endurance during physical exercise. It cleanses the body by activating white blood cells, boost the body’s immune system, and contains more vitamin C than oranges, and twice as much vitamin A as carrots. Pound for pound, wheatgrass is more than 20x denser in nutrients than other choice vegetables. 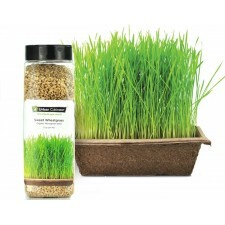 Since it is considered a vegetable in the grass stage, wheatgrass is safe for people with wheat allergies.